With Father’s Day around the corner here, I asked the Husband to put in his breakfast order early. 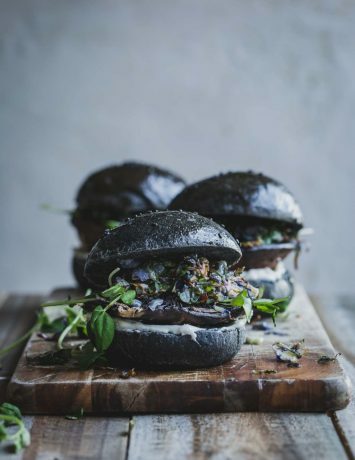 While the Elf will most certainly whip up a delicious bowl of water with sea salt, garlic skins and dairy-free chocolate duds, I thought we might like something after. You know, just to round out the meal. This Spiced Maple Apple Breakfast Crumble fills the “dessert for breakfast” guideline perfectly. Gorgeous spiced apples cooked to a caramel bliss under a pecan oatmeal crumble makes this a perfect dessert for breakfast. Tomorrow is Father’s Day. A day to celebrate the men who help shape the big people our little people are going to be. I admit I don’t think about what it means to be a Father very often; I am all wrapped up in my own neurosis about whether I am a good mother. True story. However, one of the benefits of writing a blog is that you have to stop and think before tapping away on the keys. I think being a Dad is a bit like walking amongst moving cars, balancing plates while singing Oh, Susannah. Dads have to tread a tricky path where parenting and popularity cross roads. For those Dads that are the main bread winners, away at work all day, it makes sense they want to come home and spend quality time, play time with the kids. That play time of course, upsets the balance in Mother Country. Mums don’t get to have play time, all the time because…well, we have to run the universe wearing heels. So, Dads have to somehow balance quality time with the kids while carefully staying within the traffic cones set up by Mum. All the while, fighting driver fatigue from being at work all day. And let’s not venture in to the nights where the Dads are too busy/exhausted/sick to play; that’s a traffic hazard no man wants to tackle. You will have quality time…but not too much, got it? Good. And that’s just in “traditional” family units. I will say this though. Being a Mum is tough but we don’t hold the monopoly. I tip my hat to Dads who not only help mould little people in to better versions of their parents but do it while navigating the home planet without a map. Happy Father’s Day to you all. And to the Elf’s Dad, I say a special thank you. I know I put up some serious road blocks, but you always find your way and she is a bigger little person because of you. Now, let’s see about that dessert for breakfast. 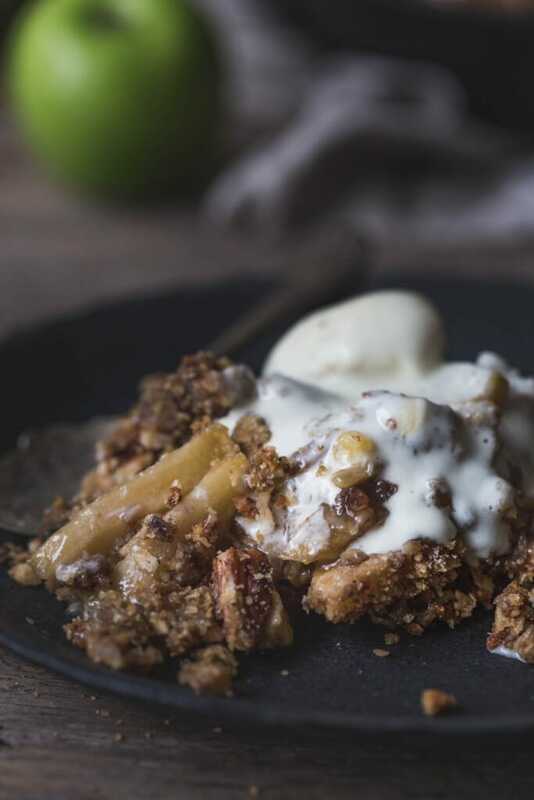 With intoxicating aromas wafting from the plate, this spiced maple apple breakfast crumble is a lovely, decadent start to the day. While it is decidedly dessert-like, this crumble is filled with all things breakfast including nourishing oats, pecans, sunflower and pumpkin seeds and of course, soft baked apples. Maple, instead of traditional sugar, gives the dish a warm, full-bodied flavour lifted by slightly floral cardamom and aromatic cinnamon. Sigh. Like every thing I have ever eaten in my life, this spiced maple apple breakfast crumble is made even better with a good scoop of ice-cream. Although coconut yoghurt works too, creamy ice-cream just completes the whole “dessert for breakfast” vibe. 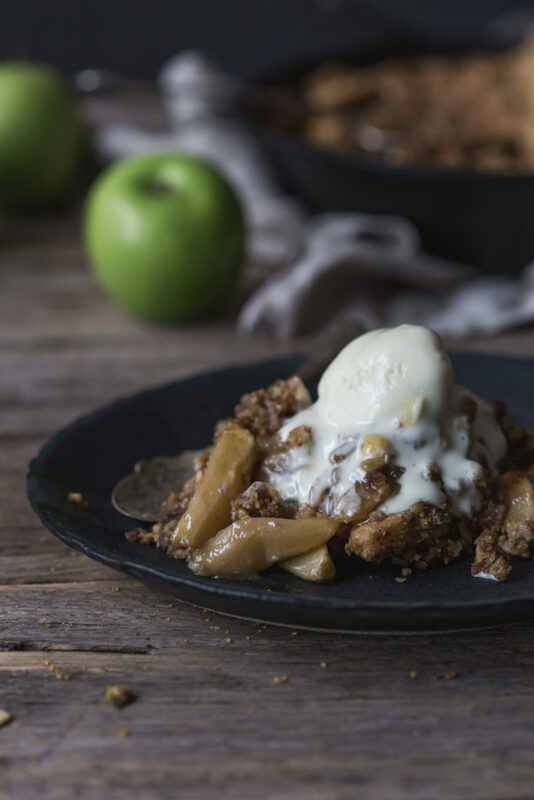 This Spiced Maple Apple Breakfast Crumble fills the "dessert for breakfast" guideline perfectly. Gorgeous spiced apples cooked to a caramel bliss under a pecan oatmeal crumble, this dessert is ready for breakfast. 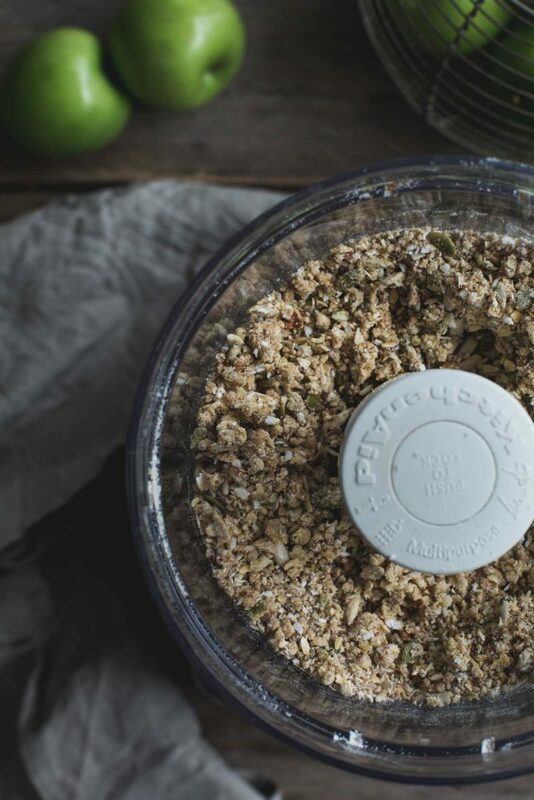 To make the crumble, combine the flour, sugar, oats, coconut, cinnamon and cardamom in a food processor and pulse briefly to combine. Add the pecans and seeds and pulse again to break up. Tip the mixture in to a bowl and rub the cold butter in with your fingertips until large crumbs form and the butter is throughout. Set aside. 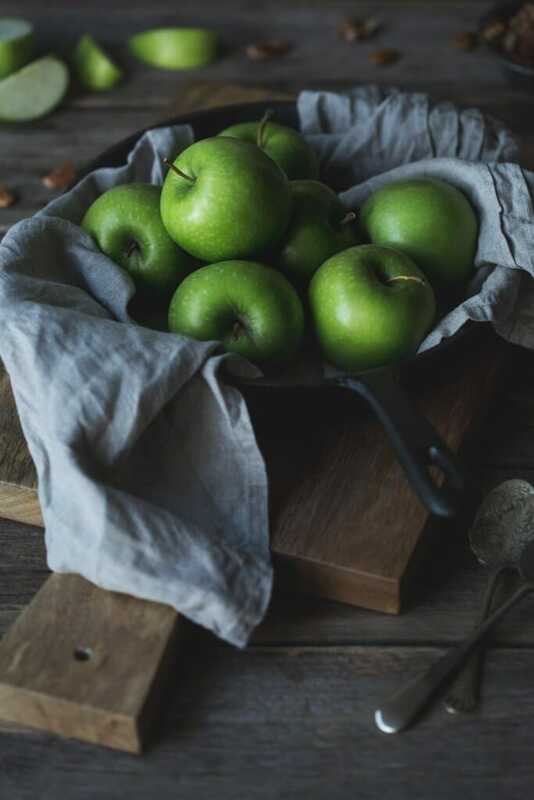 Combine the apple mixture ingredients in a large bowl and stir to coat the apple. 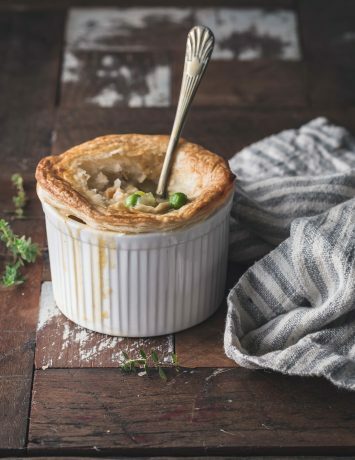 Pour the apple and the syrup in to a large pie pan or cast iron skillet. Spoon the crumble mixture over the top making sure to cover the apple as much as possible. Bake in the oven for 35 minutes. If the crumble is browning too quickly, fix kitchen foil over the top and continue cooking. Turn the oven off and leave the crumble inside for another 10 minutes. Remove from the oven and serve either warm or room temperature with vegan ice-cream or coconut yoghurt. Teff flour is another gluten-free flour that can be used in this recipe. Coconut flour can also be used for this recipe. 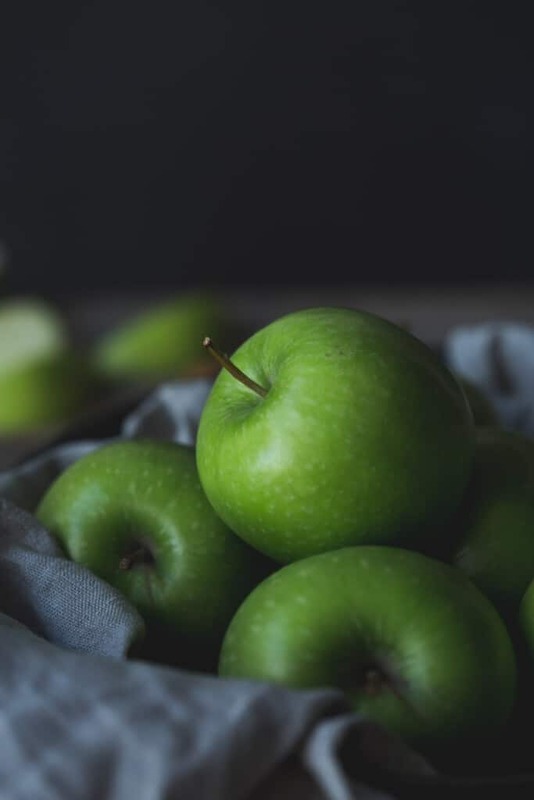 Reduce the amount to a 1/4 cup and add 1/4 cup of water to the apple mixture. Coconut flour absorbs liquid so more liquid is required. For a more caramel style crumble, replace the maple syrup with unprocessed brown sugar. Thanks so much Aria. I am so glad you like it. Thanks for stopping by and the lovely note.